Against all odds, after only 70 years since the Holocaust’s massacre of six million Jews, including two million children on European soil, anti-Semitism is dramatically on the rise in thought, rhetoric, and deed. This time around, however, hatred for the Jews has taken a nationalistic, ethnic character that is supported by obsessive incitement, which uses classical styles of anti-Semitism – both religious and political – and transforms the latter into the Boycott, Divestment and Sanctions (BDS) campaign. Together, this has led to daily incitement against the state of the Jewish people, Israel, and also extends to Jewish communities in the Diaspora. In 2016, the Organization for Security and Co-operation in Europe (OSCE) reported 1,661 anti-Semitic attacks, 240 of which directly targeted individuals.1 Data from the Anti-Defamation League describes a situation in which one in four individuals in Western Europe harbors anti-Semitic attitudes.2 However, it is not only a matter of attitudes, but also of an uninterrupted trail of blood: in 2012, a teacher and three children were gunned down in front of a Jewish school by the French-Algerian Mohammed Merah; in 2014, four people were slaughtered at the Jewish Museum in Brussels by Mehdi Nemmouche, an ISIS terrorist; in 2015, four more were left dead at the Hypercacher kosher supermarket in Paris, again at the hands of an Islamic extremist linked to the Kouachi brothers, who perpetuated the Charlie Hebdo massacre two days earlier. Many cruel murders have, with heinous determination, been carried out against individuals solely because they were Jews: Ilan Halimi, Sarah Halimi, Mireille Knoll, etc. An anti-Semitic post appears in Europe every 83 seconds on Twitter and other social media networks, like Facebook and YouTube. In 2016, more than 382,000 anti-Semitic posts in 20 different languages were uploaded; in June 2018, Berlin allowed a rally “against the existence of the Jewish state,” which was managed by Hizbullah, where signs with the words “Death to the Jews” were seen. Boycotting episodes erupt at sports events, campuses, theaters, supermarkets, and cinemas; important European actors and singers boycott Israel; genocidal terrorist incidents have taken place in Jerusalem, Paris, Toulouse, and Brussels without anyone saying a single word about Jews being specifically targeted. The growth of the European Right in our time is observed under a magnifying glass in the international debate because the Right in the past has certainly hosted, nurtured, propagated, and acted on anti-Semitism. However, a more thorough analysis provides us with another picture that we will examine: not only the anti-Semitic and Israelophobic Left, but also the Islamic communities in Europe are becoming more and more radicalized. In September 2018, the Trump administration announced plans to change the way the U.S. Education Department investigates allegations of discrimination against Jewish students and is adopting a new definition of anti-Semitism. In recent years, several government agencies in Europe have taken similar steps, including the foreign and justice ministries of Britain and Germany. They already have policies that deem anti-Zionism a discriminatory practice because it solely denies Jews the right to govern themselves. But the policy of the U.S. State Department specifies the test used to define anti-Semitism is that of “three Ds,” delegitimization, demonization, and double standards applied to Israel. Natan Sharansky crafted this definition. The term “anti-Semitism” dates back to the 1870s, and it’s the ethnic-racial modernization (according to new secular and scientific theories in vogue) of confessional anti-Judaism. “Semite” is a purely linguistic term, which includes Hebrew, Arabic, and Aramaic, as well as Babylonian, Assyrian, and Ethiopian languages. The Aryans, in contrast to the Semites, were the invaders of India, who also call themselves so for linguistic, non-ethnic reasons. They have nothing to do with the Germans. Christianity was the first actor to attribute to Judaism a cosmically evil quality – more than Islam – since it intended to replace Judaism, the religion of Jesus, and its texts, all of them linked to the Old Testament. These stereotypes have not disappeared but have shifted overwhelmingly to the State of Israel and the collective Jew. It’s enough to remember the outrageous Arafatian invention – which was embraced by international bodies like UNESCO – that the relationship of the Jews with Jerusalem and the Western Wall is fiction. These international organizations rejected the well-documented historical memory of Tacitus, Josephus, the Bible, and the Gospels. They never saw the Arch of Titus in Rome, with its incredibly realistic relief portraying the expulsion of the Jews in 70 C.E. They claimed the Jew-Jerusalem connection is an ad hoc invention to occupy a land they yearned for because of colonial greed. The new anti-Semitism we see today is linked to a pathological form of Israelophobia. This anti-Semitism is also very dangerous for the society that harbors it. Terrorism is the twin brother of this racial hatred, and although the Jews are its favorite prey, its lethal poison spreads to all surrounding societies. Demonization occurs when the actions of Israel are inflated beyond all proportion. An unfortunate and increasingly common example is the comparison of Auschwitz to Gaza, as made by the Nobel laureate José Saramago and composer Mikis Theodorakis. There is a double standard when the United Nations, its organizations, or the European Union repeatedly targets actions of the Jewish state while ignoring greater offenses committed by other states. Delegitimization of Israel, declared by Arab and Palestinian organizations and the BDS movement, denies the Jewish state’s fundamental right to exist. For example, the BDS movement demands solutions that would necessarily lead to the disappearance of the State of Israel. BDS’ connection with Islamic organizations that incite or endorse terrorism shows its violent backdrop, revealing it as an undemocratic movement. BDS’ claim that Israel is a racist or apartheid state like the racialist South Africa suggests they believe that Israel must be destroyed as apartheid South Africa was. The most acutely anti-Semitic movements today express the same sense of frustration that Germany did in the 1920s and 1930s, when it was reduced to humiliation following the Treaty of Versailles after World War I. Nazism went on to use anti-Semitism within its ideological framework for its war of conquest. Today, it rises from ideologies that have been defeated in the West and from a terrorist war on the eastern front. Europe in crisis is increasingly becoming anti-Israel. The best example of the links of this new anti-Semitism with terrorism concerns an important Western leader of the Left, Jeremy Corbyn, secretary of the British Labour Party. A photograph of Corbyn that appeared in the international press at the end of July 2018 goes together with his refutation of the definition of anti-Semitism outlined by the International Holocaust Remembrance Alliance (IHRA) that, with 11 examples, follows Sharansky’s 3 Ds definition. But several photos taken in Tunisia in October 2014 showed him laying a wreath of flowers at the grave of the Palestinians who perpetrated the massacre of 11 Israeli athletes at the 1972 Munich Summer Olympics. Posing alongside Corbyn in another photograph was Fatima Barnawi, who tried to blow up the Zion cinema theater in Jerusalem in October 1967. The German war across Europe and the Shoah crushed every appearance and claim of human rectitude. The legitimacy of self-defense as a corollary of the “Thou shall not kill” commandment collapsed, while the goal of “peace” became an intimate, overwhelming dogmatic standard for the Western individual, the democratic citizen. The peace campaigns of those years, invented by the USSR during the years of the Cold War in the 1950s, dispatched men and women with banners of all stripes who marched for peace against the United States and the atomic threat, as well as in defense of the Cuban revolution, pro-Soviet African revolutions, and then the Palestinians. The Jews, at the beginning, were considered allies among the Communist sympathizers, given what they had suffered during World War II from the Right, the Nazis, and the Fascists. The Jews, for their part, sought a relationship with the Left to feel themselves at home in Europe again after the Shoah. The Communist persecutions and Siberian confinement were set aside. Becoming Left-wing for many Jews was a matter of identity and memory. The semantic value of the word “peace” soon incorporated all the values of human and civil rights, only that it was seized by an illiberal political party. Pravda published the following on October 4, 1967: “Zionism is dedicated to genocide, racism, betrayal, aggression, annexation […].” The late great Middle East historian Bernard Lewis reported that at the World Conference of the International Women’s Year held in Mexico City in late June and early July 1975, the “Declaration on the Equality of Women” repeatedly stressed the participation of women in the struggle against neocolonialism, foreign occupation, Zionism, racism, racial discrimination, and apartheid. Peace in the Middle East became a giant playground of rhetoric and lies for the global Left, with the bad “colonialists” and warmongers on one side, i.e. Americans and Israelis, versus the good Palestinians and Arabs (allies of the USSR after having been allies of Nazi Germany) on the other side, in a monstrous revision of the history and the entire Israel-Arab narrative. But why was the USSR so successful? Because the Europeans, and later their main institution, the European Union, undertook to cancel the memory of the European travesties of war, Nazism, Fascism, nationalism, and borders. In their place, a creed devoted to human rights writ large was established. It made acceptable, as a matter of fact, every illiberal aspiration connected to the USSR camp (the “peace camp”) that wanted to help “oppressed people” wherever they were politically useful to them, portraying dictators and terrorists as desperate fighters for a better life against colonialism. Still, Israel has seen anti-Semitic hatred and European disapproval increase despite it being targeted by more and more terrorist attacks. Israel’s wars of defense against Hamas or Hizbullah have been condemned by the European Union and in Europe’s public squares while Israel undertook purely defensive military actions. Israel is openly treated by the European Union, in clear violation of the three D’s, as a violent, aggressive state, as a country to discriminate against, seen as always on the brink of catastrophe, of disappearing, even though its economy and socio-cultural strengths suggest otherwise. The official European attitude has been such that a popular lexicon has been compiled among the Europeans: “apartheid state, child-killer, colonialist, and genocidal,” while the number of Palestinians grows vertically. They believe that Israel is unworthy of existing and with it every Jew in the Diaspora who is sentimentally or politically attached to it. It is sad to say, but today international organizations, first and foremost those of the UN – from the General Assembly to the Commission for Human Rights – and then the European Union, incessantly condemn Israel as their leitmotif, presenting a new kind of anti-Semitism in which “human rights” are used as masks to hide discrimination of Israel and the Jews. The indisputable origins of Israel as the homeland of a people who sought to return to Jerusalem for centuries are unrecognized, used, instead, as the symbol of oppression and colonization of the Palestinians. The word “Zionism” has been turned upside down to the point of mockery and horror, synonymous with all Jewish perversions invented by anti-Semitism: lying, blood libel, conspiracy, racism, apartheid, and ethnic cleansing. Contemporary anti-Semitism is anchored in the 1975 UN resolution, “Zionism is racism,” a perverse and brilliant formulation despite its total lack of connection with reality. Its implication is clear: Israel must be destroyed just like racism in the post-World War II world. The resolution in effect endorses the genocidal hatred propagated by the Palestinians, Arabs, and later also by the Iranians (“Israel is a cancerous tumor that must be eradicated,” repeats Iran’s Supreme Leader Ayatollah Khamenei). The process that led to this new type of anti-Semitism linked to a human rights paradigm has decisively influenced the relationship between Europe and Israel. The premise is that Israel still belongs to the West that is guilty of appropriating territories, of nationalism, exploitation, and oppression. This led Europe first and foremost to an astonishing detachment from the horrific terrorist attacks against Israel and the incessant aggression that it must face: the thousands of victims of Palestinian terrorism inflicted against entire families, bystanders, infants, children, pregnant women, and children (the notorious kidnapping and execution of three teens on the street on their way back from school in the territories in June 2014 is sadly one such example). The European mind pays them little heed, just minimal ritual attention, without regret or any genuine disapproval of the terrorists. The European Union has taken many anti-Israeli initiatives based on double standards, as in 2015 the “guidelines” to outlaw products from the “occupied territories,” a discriminatory and therefore anti-Semitic decree, never used against Moroccan interests in Western Sahara, Indian Kashmir, or the part of Cyprus occupied by Turkey. And this is the moment, however challenging it may seem, for a difficult conceptual shift: today, despite the lively debate about the new Right-wing populism that is asserting itself in Europe, even with the remarkable anti-Semitic bumps in the unexplored terrain, the new populist governments in Europe don’t exhibit any signs of a growth in anti-Semitism. It’s safe to say that as these movements have become entrenched, their most extreme factions have been removed or neutralized. Hungary’s Prime Minister Viktor Orban is not Marton Gyöngyösi of Hungary’s Jobbik party, as Austria’s Sebastian Kurz is not the late Right-wing Jorg Haider; France’s Marine Le Pen is not her father, Jean-Marie Le Pen, and Italy’s Right-wing Lega Party is not the far-Right Forza Nuova. In fact, in Italy, the Lega doesn’t seem to partake in any negative mythologies about Israel, nor are any anti-Jewish attitudes attributed to this party. On the contrary, at Lega leader Matteo Salvini’s rallies, as well as during his visit to Israel, the press noted that Salvini expressed strong words of sympathy for the Jewish State. However, this is not the case with the other major political force that sits in the new Italian government: The Five Star Movement has often shown signs of acute impatience vis-à-vis Israel and support for the Palestinians. It has emerged in repeated meetings with the Israeli government, that the Central European Visegrad countries (Czech Republic, Hungary, Poland, and Slovakia) hold steadfast in their commitment to crush any anti-Semitic resurgence (as opposed to Spain, France, England, and some of the Northern European countries). The Visegrad Group has so far shown their resolve despite the concerns of a possible emergence of anti-Jewish sentiments in the context of new ideologies that place national borders and identities at the core of their political agendas. Particularly significant were the meetings between Benjamin Netanyahu with various governments of Eastern Europe, as well as the interest of the Czech Republic and Bulgaria to move their embassies to Jerusalem and to establish cultural centers in Israel’s capital. Hungarian Prime Minister Victor Orban has ostracized the anti-Semitism that the Jobbik Party expressed. Orban said during a visit to Israel in July 2018, during which he was put under a magnifying glass in order to determine his views, that his country made a fatal mistake by not defending Jews from the Nazis during the World War II. He continued to state that anti-Semitism in Hungary today has been beaten, that he will continue to fight it decisively, and that his country’s relationship with Israel is devoid of any shadows. Orban affirmed during his visit to Israel in July 2018 that Western Europe is more anti-Semitic than Eastern Europe. His remark identifies a nascent reality: in a fearful Europe that finds itself in the ideologic grip of a leftist ideology and of Islamic anti-Semitism (stubbornly denied by its politically correct elite and institutions) the Visegrad Group and the countries that have openly opposed this status quo tend to accept Israel and the Jews today, because they understand a situation in which boundaries, identities, and even self-defense are admissible; something the globalist champions in the European Union simply can’t understand. Looking at recent history, it is evident that the former Communist countries desire to distance themselves from their hated Soviet past and from Third Worldist, anti-colonial, and anti-capitalist doctrines that selectively favored a so-called pro-human rights approach and made the United States and Israel the worst enemies of the humble and exploited. This is also true in today’s terms: Trump’s policy vis-à-vis Israel is much easier for Eastern European and nationalist countries to digest than for the supporters of European antagonism toward the United States, especially Trump’s version. Therefore, there is a consensus in Eastern Europe supporting Trump’s policy that takes a new stance toward Iran and its proxy Hizbullah and a new attitude toward Israel expressed by the decision to move its embassy to Jerusalem. Even on Russia, the attitude is different. The new governments in Europe perceive the international framework as an alternative universe to the ideological structure that gave birth after the World War II to the European Union, with its anti-Israel, pro-Arab, pro-Palestinian foreign policy. From the ideological point of view, the very basis of traditional anti-Semitism that paints the Jew in anti-Semitic Nazi-Communist hues as a parasite of Western society and a secret enemy is totally out of sync with the new “sovereign” countries. Today, Israel and the Jews of the Diaspora are perceived as custodians of Western values. Even more, because of the incessant Muslim incitement against Jews, they are seen as solid Westerners, tied to the Judeo-Christian Western culture, and great enemies of international terrorism. 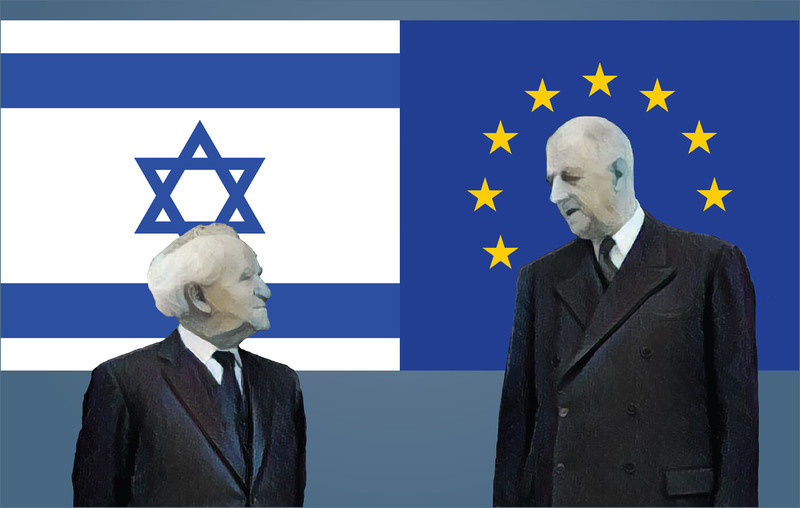 Today, we have never heard – as during every other anti-Semitic resurgence – that the Jews bear responsibility for the economic crisis, or the troubles facing the euro and Europe’s rampant unemployment. The classic anti-Semitic accusation of an economic plot doesn’t seem to be part and parcel of the European Right’s perspective, which blames the European Union for the economic crisis. Even more, the Eastern European countries have respect for Israel’s resolve to defend itself against the radical Islamic dangers that attack it. They believe that much can be learned from Israel’s experience in the fight against terrorism. Israel is world-renowned for its excellence in security and counterterrorism. Israeli Prime Minister Netanyahu revealed several times in 2018 that Israel thwarted terrorist plots around the world. In July 2018, he called on Europe to stop appeasing Iranian terrorism, revealing that an Iranian attack had been blocked by Israel on French soil just a few days before. The Islamist threat that Israel confronts daily is still obstinately belittled by the European Left. But as the common awareness of that threat grows, its denial is faltering more and more in the face of every new terrorist attack. The idea of nation, identity, and defense today inspires a pro-Israeli policy that has never before flourished in the European Union. There is reasonable concern that we may forget the atrocious acts that the Right has perpetrated against the Jews historically, including the racial laws and deportations. But it does not exempt us from seeing with dazzling clarity that on the Left and in the Muslim world contemporary anti-Semitism, linked to Israelophobia, has become a large and multifaceted danger. The hate is nourished by the post-war thinking of European intellectuals such as the Nobel Prize winner Jose Saramago, Mikis Theodorakis, and Günter Grass. Islamic anti-Semitism is a significant part of the great wave of contemporary anti-Semitism. Haj Amin al-Husseini, the Grand Mufti of Jerusalem (1921–1948), attempted to coordinate the extermination of the Jews with Hitler (meeting him in November 1941) and offered him an Islamic brigade. Husseini left an enormous impact on the Arabs of the Middle East, including Egypt, Syria, Iraq, Jordan, and of course Palestine. Islamic terrorism has at its core the goal of annihilating Jews, erasing them from the face of the earth. Shahids, or martyrs, are considered heroes and celebrated both in Palestinian society and among believers scattered across Europe. The Hamas charter enshrines genocide. The leader of the Muslim Brotherhood, Yusuf al-Qaradawi, calls for the killing of Israeli civilians and promises that the next Holocaust will take place at the hands of the believers.3 The Iranian establishment promises daily that the Zionist “cancer” will be wiped off the map. Raised with the psychological brainwashing that the Jew is an enemy of Islam who has usurped the lands of the Umma, many Muslims in Europe exhibit or harbor anti-Semitism. Acts of hatred against synagogues and Jews wearing a kippa or a star of David are the order of the day, to the point that leaders of Jewish communities across Europe, for example in Denmark, advise Jews to avoid wearing them. Screenshot of an attack by an Arabic-speaker on kippa-wearing Israelis in Berlin, April 2018. Islamic attacks against Jews have already been described at the start of this paper: nothing compares to the extreme hatred of Jews that promotes a genocidal anti-Semitism. It is a sentiment that fuels suicide terrorism and encourages young people to become shahids because this guarantees them eternal life, while their community exalts them by dedicating schools, squares, and institutions in their name. Approximately 1,600 Jews were killed in suicide attacks in the second Intifada. Israel’s government must, as I believe it does, keep defending itself and the international Jewish community from any kind of anti-Semitism. Israel has a duty and right to choose to have commercial, scientific, and security relations solely with those countries that prove to be sincerely engaged in combating anti-Semitism. Right-wing governments, since their constituency is diversified and contains anti-Semitic fringes, are confronted with a direct and difficult task. They must respond to the danger of anti-Semitism, not just to foster relations with Israel, but also to protect and build a civilized culture. Anti-Semitism of every kind must be relentlessly banned by Western governments to a much greater degree than what has been done to date; they should contemplate equating Israelophobia with anti-Semitism. Europe must embrace the goal of changing its policy. The fact that this request is being directed to the Right today does not at all exonerate the European Union from changing its path. The aims must be clear and rigid, directed against the stereotypes of Islamic anti-Semitism and all connivance with terrorism. But let us close on a positive note. Recently, the Belgian government cut financial assistance to Palestinian schools, noting that the Palestinian Authority has named schools and cultural institutions in honor of terrorists. Europe finances the worst of terrorism when it does not sufficiently control the use made by the Palestinian Authority of donated funds to incite and foster terrorism. Here we have positive gestures that can contribute to the goal of winning the fight against anti-Semitism today while honoring the debt to the past.